As I mentioned in my last post International Night – Makeshift Chili and Quesada we are working on a new idea for planning meals at least for us, and although Saturday is supposed to be fish night I went with corned beef and Guiness in honor of St Patrick’s Day. My son used to go crazy for corned beef NY York style deli sandwich so thick that you had to attach hinges to your jaws. In my family we call that a “Muriel Saver Sandwich”. 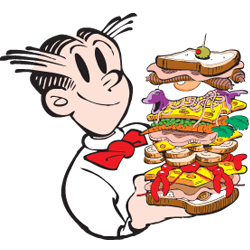 She and Dagwood had that in common. Anyway I tell you 60 minutes into the dish and the house started to smell soooooo good my stomach started to growl and the end results were great. We had tried Dijon mustard and brown sugar glaze a few years ago and I think I like that slightly better but this one was really good. 4 lb. 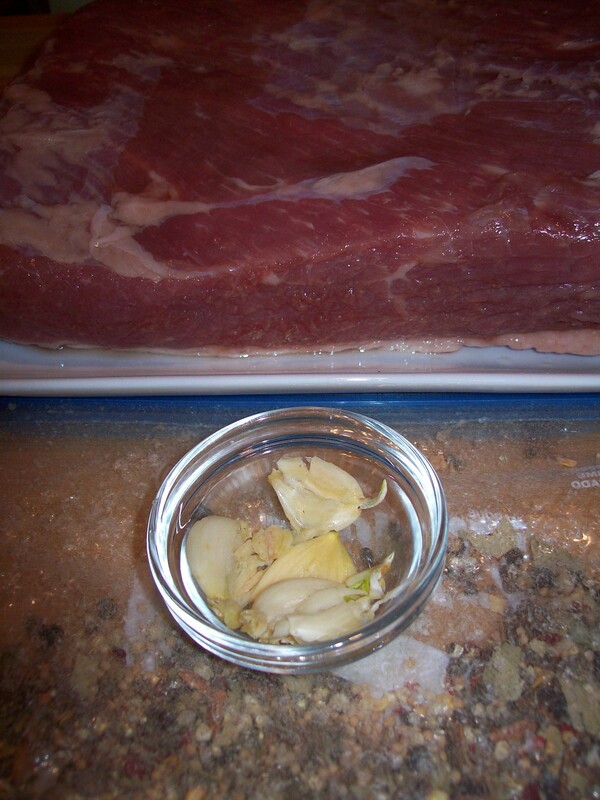 corned beef brisket first cut (we prefer low sodium) you can use whatever cut you prefer. Combine the first 9 ingredients in a plastic storage bag and crush with rolling pin. Empty into Dutch oven and place corned beef (I rinse but your choice), fat side up add the garlic and pour in enough water to cover with water. Discard the spice packet that comes with the meat. Cover and place in oven for 3 hours turning meat halfway. I used the Le Creuset Dutch oven and I am still trying to get used to cooking with so I turned the oven down to 300◦ at half way point. Any hints on using these are welcomed. Line a baking sheet with foil and place the cooked corned beef fat side up. 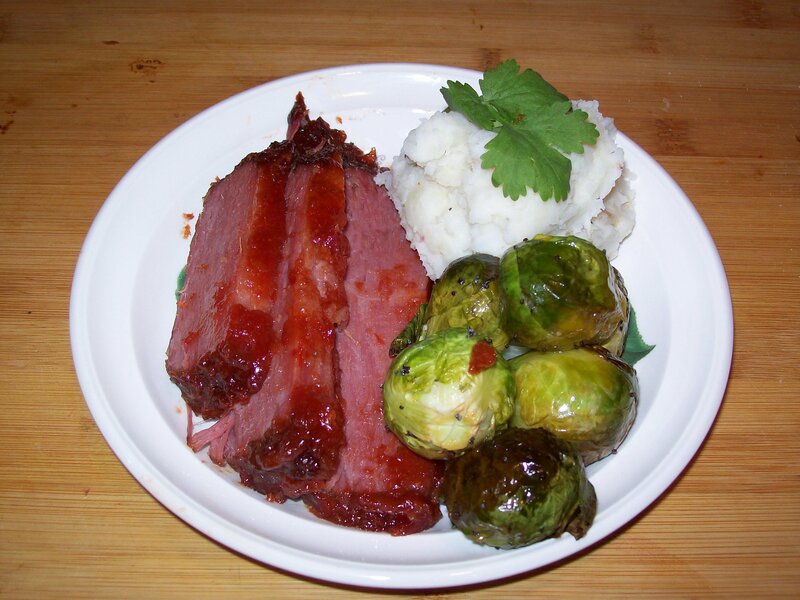 Brush about ½ of glaze over the top and sides of the corned beef. Roast in oven for 15 minutes brushing with remaining glaze about half way through. Glaze should start to caramelize. Let stand cover loosely for 5-15 minutes before slicing against the grain. Now we chose to serve with smashed garlic potatoes and oven roasted Brussels sprouts but you could choose to go more traditional with cabbage wedges and some carrots on the second turning but you may have to adjust cooking time up slightly. This entry was posted in Beef, Meat and tagged Black pepper, Corned beef, Dutch oven, Glazed, Mustard seed, Saint Patrick, Saint Patrick's Day. Bookmark the permalink.